Clymer manuals are comprehensive, straightforward and simple to use guides written for the beginner or do-it-yourself mechanic bike owner. 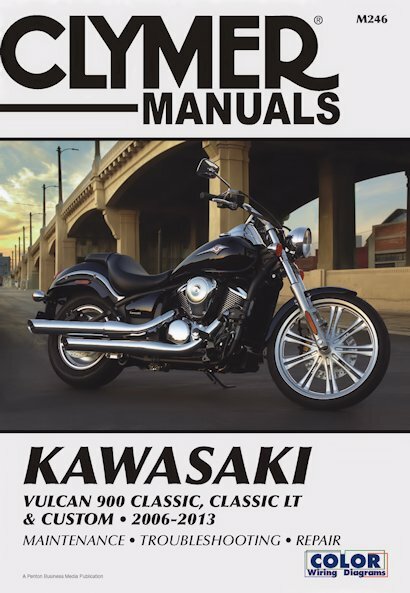 The guides feature clear and easy to understand language, detailed steps with associated diagrams, photos and more to help you complete a wide range of service, maintenance and repair projects on your Kawasaki Vulcan 900. The Kawasaki 900 Custom manual also includes expert tips and step-by-step care instructions to improve your bike's overall performance and help you take excellent care of your baby. All Clymer manuals ship for free to the contiguous 48 states for an added value. Our manuals are backed by our 30-day money-back guarantee so you can shop with confidence. Either love your new manual or return it for a refund. The following video overview of the Clymer M246 Kawasaki Vulcan 900 Classic, Classic LT & Custom 2006-2013 was published by Clymer Manuals. Enjoy! Ask a question about Kawasaki Vulcan 900 Classic, Classic LT & Custom 2006-2013. It is not a clear path to the subject I am looking for !!! Clymer: an on the job helper. Although I usually get a factory service manual for a new motorcycle, I also buy Clymer's manual too. Clymer instructions are clearer to me, and they often offer simple suggestions to greatly reduce the time involved in some procedures. When I see a much better and simpler way of doing something, it's helpful to find that someone else has discovered the same shortcut that I figured out. This occurred again yesterday, when I checked Clymer against the factory statement that it is necessary to remove the engine from the frame of my motorcycle, Clymer agreed with me, and I saved a whole lot of needless effort in repairing my motorcycle and riding....rather that working on it. YEAH, I RECOMMEND CLYMER MANUALS! Just what I needed to get the goods on my bike. Much more cramped than a car this helped me to do it myself and save a few bucks. Delivery was prompt, Kawasaki manuel comprehensive, complete. Received book before delivery date in excellent new condition. I have used this manual to perform a few jobs on my 2013 Vulcan, and I found it very detailed and easy to follow. Great resource for the DIY mechanic. This manual is well organized and provides a lot of information for the motorcycle owner who enjoys diy maintenance as well as more technical problems. I'm not a trained motorcycle mechanic but this manual provides loads of tech information not offered by the pocket owners manual you get with the bike. Allows the owner to recognize issues that might go unnoticed without this manual. Well worth the price. I like the way this manual is put together. Spent the morning after getting it thumbing through the pages learning the location of various parts. My bike runs great but with this manual I feel confident that I can make repairs as necessary. Great Job Folks!! I call it MY KAWASAKI BIBLE because it covers everything about my motorcycle which is a Vulcan 900 Classic LT 2007. It is rich in Black and White photos of each system of the bike. It tells how to trouble shoot, maintain, repair your specific model without generalizing as in previous manuals. The manual is priced below all others as compared to other sites I researched. The Motor Book Store is the one to go to. If you searched long and hard you may find a lower price but do you have that much time? My order for my manual was delivered fast as promised. Now, I have a better understanding of the how's and why's to do it better whereas, before I was limited in my knowledge. Thanks Motor Book Store and Clymer for advancing my knowledge of what I'm doing to keep my motor runnin..........Just like the Aerosmith song, 'Get your motor runnin', head out on the highway, looking for adventure, and whatever comes your way............I was born to be WILDDDDDDDDDD. YEAH! Had a chance to sit down and page through the manual. It seems to cover everything about the bike and in easy to follow instructions. It will come in very handy when I need to service the bike.